You are here: Home 2011 December Tutorial: How to Wire an RJ-45 Console Cable? Routers and network switches typically require an RS232 serial data connection to interface with the device for initial configuration. Serial data connections may also be used for diagnostics purposes, especially when a network device is malfunctioning and unreachable over the network. 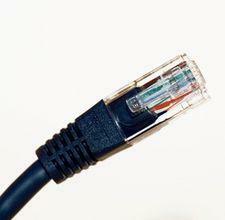 Cisco switches and routers now require a specially configured RJ45 console cable when communicating with the devices through a serial connection. Build an RJ45 console cable in order to connect, configure or troubleshoot a Cisco device. 1. Remove the screws on the cover of the DB9-to-RJ45 adapter kit and then remove the cover from the RJ45 connector. Note that the RJ45 adapter pins are numbered from left to right when looking at the RJ45 socket with the tab up. The DB9 connector pins are labeled with the pin number next to each pin in small writing. 3. Snap the cover back onto the RJ45-to-DB9 adapter. Tighten the screws to secure the cover. 4. Connect a CAT5 or CAT6 standard patch cable to the RJ45 connector end of the adapter. The Cisco console cable is now ready for use. You can identify a roll-over cable by comparing the two modular ends of the cable. Holding the cables side-by-side, with the tab at the back, the wire connected to the pin on the outside of the left plug should be the same color as the wire connected to the pin on the outside of the right plug. If your cable was purchased from Cisco Systems, pin 1 will be white on one connector, and pin 8 will be white on the other. Rollover cables, like other cabling types, got their name from how they are wired. Rollover cables essentially have one end of the cable wired exactly opposite from the other. This essentially “rolls over” the wires- but why would we need to do such a thing? Rollover cables, also called Yost cables, usually connect a device to a router or switch’s console port. This allows a programmer to make a connection to the router or switch, and program it as needed.